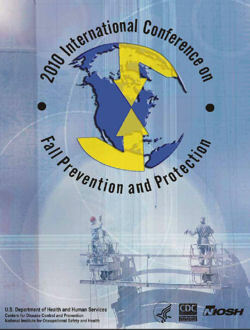 NIOSH has published global research findings from the 2010 International Conference on Fall Prevention and Protection. The 256-page document (.pdf file) covers dozens of research projects from around the globe, including fall protection for scissor lifts; costs of fall-related construction fatalities; hazard recognition for iron workers; construction incidents in India; and the impact of the United Kingdom's campaign to address slips, trips and falls from heights. NIOSH hosted the conference, which took place in May 2010 at West Virginia University in Morgantown.